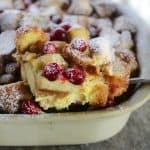 Cranberry Eggnog Doughnut Bread Pudding is made with a nutmeg flecked eggnog custard base soaked up by stale doughnuts which become a tender, rich and creamy, perfect counterpoint for the soft, baked, tart cranberries. This is the perfect cold weather or Christmas dessert. People often ask me what it’s like to have five boys to feed. Given that four of our boys are teens and one is almost there, we go through an admittedly huge amount of food. On the first Saturday of the month, our friends and Amish neighbors, Henry and Ada pull their horse and buggy into our driveway to give us a box filled with 2 dozen fresh, hot, fried yeast doughnuts with maple glaze that we ordered. Even as an avowed non-doughnut fan, I can’t resist these, but I have to move fast to get one before my beloved Biblical-plague-of-locust-boys get to them. In September, it occurred to me that Henry and Ada’s doughnuts, if left long enough to go stale, would make tremendous bread pudding. The only trouble was that the boys polished off all of the doughnuts before any could go stale. I figured I’d solve the problem by ordering an extra 6 doughnuts in October. Of course, you are probably foreseeing what happened next. There were no doughnuts left. I decided to order an extra 12 doughnuts in November. That would take us to a grand total of 36 doughnuts. To further ensure success, I immediately transferred 12 doughnuts to a box, poked holes in the side to allow air into the box to make them stale, taped the box shut with packing tape, and wrote “DO NOT EAT THESE!” all over the box then promptly ignored the box for 3 days. On the fourth day, armed with my other bread pudding ingredients, I opened the box. If you have teenaged boys, you may know what I’m about to say. For December, I ordered 4 dozen doughnuts, put twelve directly into a paper bag, taped it shut, wrote “DO NOT EAT THESE AND I DON’T MEAN THE CAT”, waved the bag in the faces of my menfolk, told them in no uncertain terms what would happen (which may have involved threats of moving their bedroom to the drafty barn in cold weather), and put the bag on the counter where I could see it at all times. I took the bag to my bedroom every night and put it on my nightstand. And on the third day, I was rewarded for my vigilance with 1 dozen stale fabulous doughnuts. I made my Cranberry Eggnog Doughnut Bread Pudding. I suppose you might think that waiting that long and going to that much trouble just for a pan full of bread pudding would render the results anticlimactic, but you’d be wrong. Cranberry Eggnog Doughnut Bread Pudding was easily the best bread pudding I’ve ever made or, for that matter, eaten. The nutmeg flecked eggnog custard base was soaked up by those marvelous stale doughnuts and turned into a rich and creamy, perfect counterpoint for the soft, baked, tart cranberries. Even those boys of mine who customarily turn their noses up at fruit in desserts partook happily. It was worth the trouble and some. …maybe next month I should order 5 dozen doughnuts? Because the doughnuts I used are roughly the size of my head, I’m giving measurements here in cups of cubed stale doughnuts. Henry and Ada’s doughnuts are approximately two times the size of the average yeast doughnut, so it is just easier that way. Yes, you need glazed, yeast doughnuts like Krispy Kremes or some such. 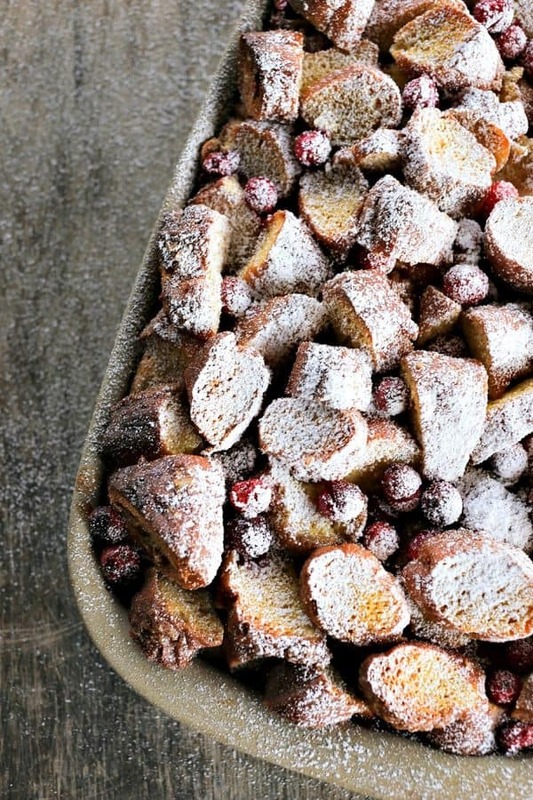 This Cranberry Eggnog Doughnut Bread Pudding recipe is only tested using them. I have no idea how cake doughnuts would perform in the recipe. I prefer for my doughnuts to be at least 3 days old before making Cranberry Eggnog Doughnut Bread Pudding with them, but if you’re in a hurry, you can chop your doughnuts up and let them be exposed to air overnight to help dry them out. If you’re in an even bigger rush, you can do that and lightly toast them in a 250°F oven just until dry to the touch. If you can stand the wait, you can mix the doughnuts up with the custard base an hour before baking. This allows the doughnuts to soak up the custard for a more even end product. If you can’t wait, it’s okay. It’ll still be delicious, just not quite as perfectly perfect. Pssst. Yes, you can definitely double the recipe and bake it in a 9-inch x 13-inch baking dish. It will, of course, take longer to cook… It may take up to 100 minutes. Just keep an eye on it. It is done when it is uniformly puffy and set but still jiggles a little in the center. If you have an instant read thermometer, you can remove any guesswork; it is done when the center measures 165°F to 170°F. 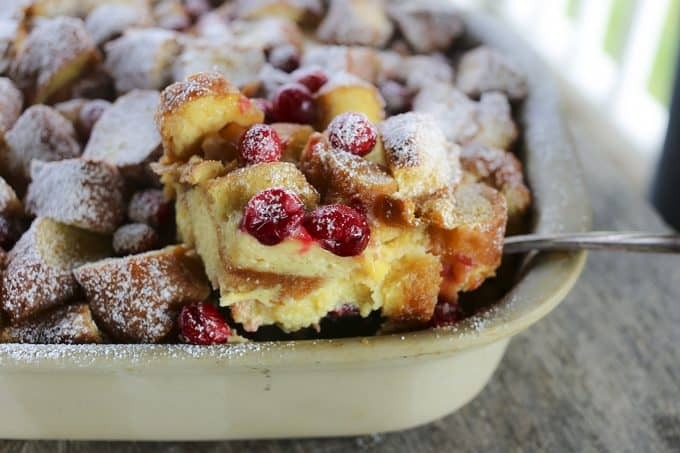 Cranberry Eggnog Doughnut Bread Pudding is made with a nutmeg flecked eggnog custard base soaked up by stale doughnuts which become a tender, rich and creamy, perfect counterpoint for the soft, baked, tart cranberries. Beat the eggs, then add the eggnog, melted butter, vanilla, and nutmeg, whisking to combine evenly. Add sugar and whisk until sugar is dissolved. Toss together the bread doughnut cubes and fresh cranberries. Generously butter a 9-inch baking dish. Arrange the doughnut bread cubes and cranberries tightly in a nine-inch baking dish. Pour liquid over the doughnuts. Press down lightly on the stale doughnuts to help them absorb the custard. Butter a piece of foil and place buttered side down over the dish. Allow it to rest in the refrigerator for at least an hour or overnight so the doughnuts can soak up the custard. Let the pan rest on the counter top while you preheat the oven to 325°F. Place a bread or cake pan full of boiling water on the lower shelf. Bake the bread pudding on the upper shelf for 55 to 70 minutes, removing the foil after the first 40 minutes, or until the bread pudding is puffy and the crust is golden brown all over the top. 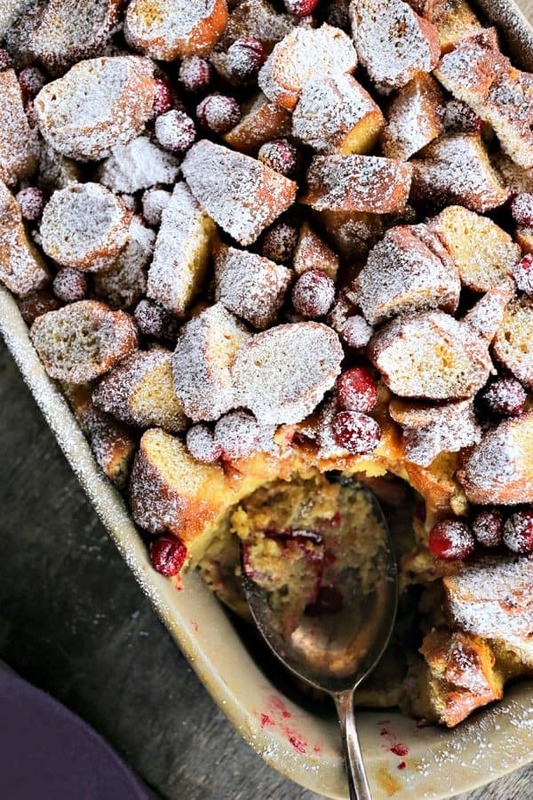 Remove the Cranberry Eggnog Doughnut Bread Pudding from the oven and allow it to cool and set up for 30 minutes before scooping and serving. If desired, dust with powdered sugar before serving. We tried this today for one of our family Christmas celebrations. It was the hit of our brunch and will be a new tradition around here! Thanks so much for this amazing, festive recipe! Now if I could just get your Amish friends to ride on over to Massachusetts…..
My husband and I made this for Christmas dessert. We LOVED it, the rest of the fam tend to be less adventureous and so stuck with the secondary traditional apple pie. We had quite a bit left over so we ate it for breakfast and it was BETTER the day after warmed up. We think it would be delish with pecans or walnuts added for a little crunch. I reduced the sugar in half, and it was plenty sweet enough with those glazed donuts. i only have to deal with one teenaged brother (though the rest of my family pounces quickly too), so this might not be as effective, but i keep a portion out for everyone to eat freely, and then hide the rest outside of the kitchen. otherwise, you never know (; wishing it was a little colder to get me in the mood for this, but it sounds delicious anyways! Do you think this would translate well to being made in a crockpot? If so, would anything need to be altered/revised?